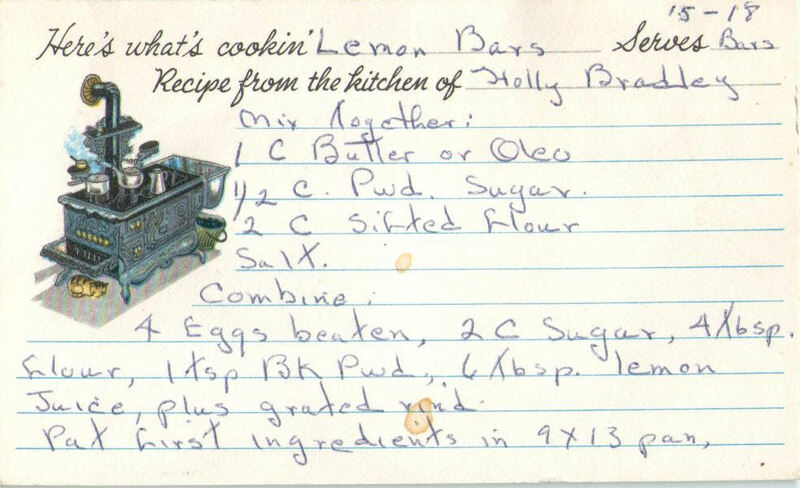 I haven't done a post from Grandma's recipe box in a while. 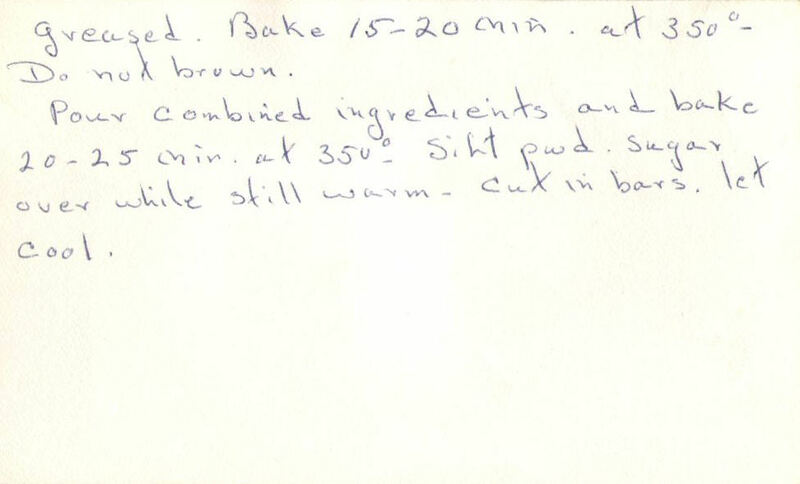 As I've mentioned before, Grandma had a sweet tooth, so her recipes run heavily towards simple desserts. This is another lemon recipe so I used the recipe sheet posted here. 4 Eggs beaten, 2 c. sugar, 4 Tbsp flour, 1 tsp Bk pwd, 6 Tbsp. lemon juice plus grated rind. Pour combined ingredients and bake 20-25 min. at 350°. Sift pwd. sugar over while still warm. Cut in bars. let cool. More modern text for people who didn't learn to cook from a recipe box. Grease a 9x13 inch pan and preheat oven to 350°. Mix first 4 ingredients, and pat into pan. Bake for 15 minutes, checking occasionally to make sure it doesn't brown. Mix remaining ingredients while the crust is baking, and pour over crust when it comes out of the oven. Put it back in the oven for 20-25 minutes. Sift powdered sugar over the top while it's still warm. Cut into bars and let cool. 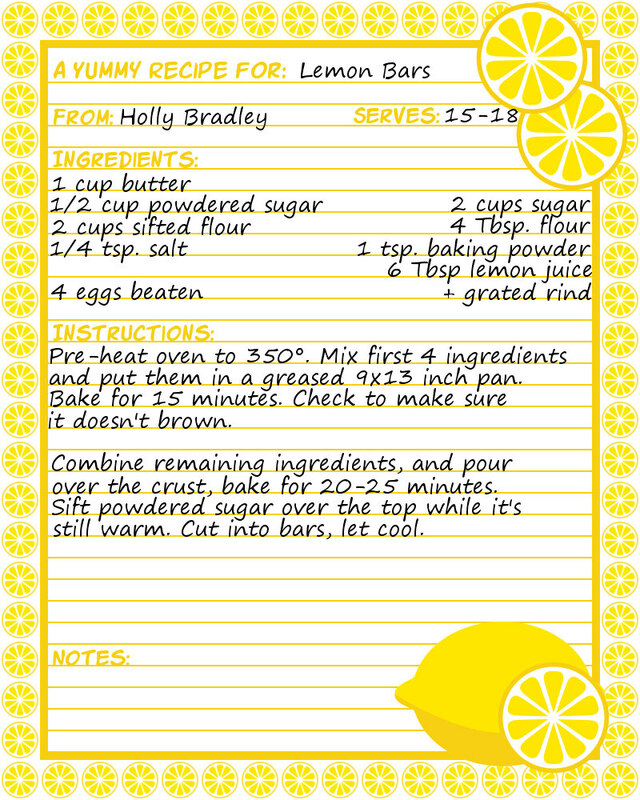 The first part of the recipe makes a nice cookie type crust, and the second part makes something like a lemon curd. Not exactly a lemon curd because the lemon juice and baking powder combine to create a bit of lightness. and it doesn't have butter in it, but a very similar flavor. It's another easy to adapt and play with recipe. I like adding nuts in the crust and a bit of vanilla in lemon mix. Other ideas are to mix cocoa powder into the crust, and substituting the lemon juice with half orange juice and the lemon zest for orange zest. Chocolate orange flavors are always good. This recipe WILL work with Splenda or other sugar substitutes. 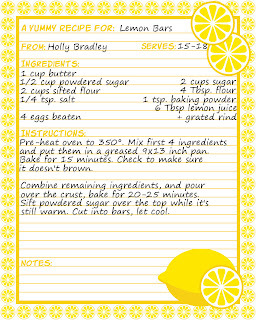 Click on the image for the full sized version of the recipe sheet. For lemon bars, I am weak. This sounds like a lovely spring delight. Awww, thanks for the memory! I have several of these same recipe cards in my recipe treasure chest. One that I wrote as an eager 4H-er headed to the county fair with Granny's Apple Cake. OMG!! MY mom used the same cards, and i still have quite a few empty ones!! i still use them!! 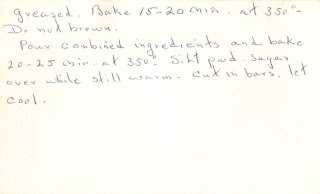 thanks for updating the recipe... i have done the same to many of my grandmother's recipes! !